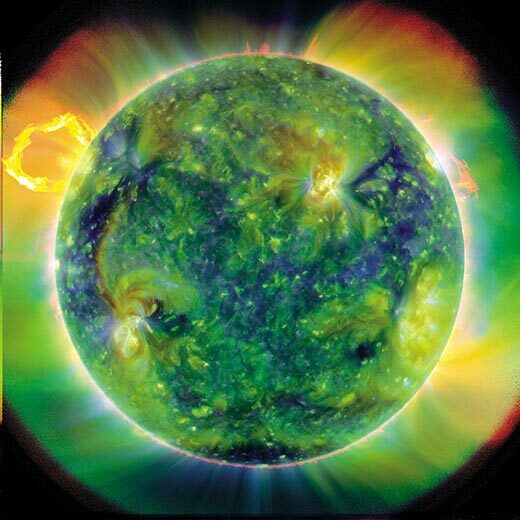 Our Sun is a giant nuclear fusion furnace that converts millions of tons of hydrogen into helium every second. The result of these explosive nuclear reactions is sunlight. But the warm smiling orb we drew in crayon as kids, which nurtures our gardens and makes us look good in board shorts, is also a violent star exploding with energy. Reactions this powerful can cause massive cosmic events that affect our entire solar system. NASA wants to monitor such activity because sunspots and other solar phenomena can have adverse effects on man-made objects in the atmosphere and here at home. Solar activity has caused flight interference, obliterated satellites and debilitated power grids in the past. Scientists estimate that if a solar storm the size of the largest on record (which happened in 1859) were to hit today it could knock out satellites, cripple power grids and disrupt GPS systems to the tune of a trillion dollars.